When full coverage is required, MaxTrek is the perfect choice. This popular style shoe cover completely shields shoes all the way up to the laces. 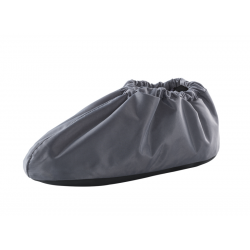 MaxTrek shoe covers are washable and have a long life expectancy, usually between 6 and 9 months. All seams are double stitched and reinforced to ensure a long life. MaxTrek is available in four sizes to ensure a proper fit. If you would like assistance with sizing, please contact our office at 1-800-978-1786.